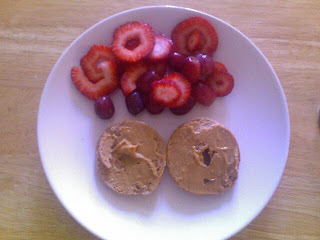 I forced myself to eat Breakfast which was a 100 Calorie WW Bagel with 1 tbsp of PB, Strawberries, and Grapes with my usual coffee. Ojala que sientas mejor. I hope that meant 'feel' and not sit! Anyhoo- you should be at work keeping me entertained! you're doing laundry? for god's sakes, girl, this is not the time! you're home, and even if you're sick...time to PAMPER yourself! hahaha! do an avocado facial! paint your toes! walk around the house naked (saw this at an episode in Friends, always fascinated by the idea)!